In the current study dynamic gravimetric vapour sorption (DVS) and inverse gas chromatography (IGC-SEA) have been used to characterise the energetic and acid-­‐base properties of a calcined ruthenium oxide/MCM41 catalyst as well as the corresponding MCM41 support. Thermodynamic parameters of catalysts are highly relevant for practical applications. In particular, surface energies and acid-base properties of catalysts are of high interest since they reflect properties of active sites involved in the catalytic process and the initial adsorption step. Dynamic vapour phase techniques are interesting tools for the determination of these properties. When compared to standard wettability experiments, they provide two main benefits. They can easily and reproducibly be applied to powders and a wide variety of probe molecules can be selected. In Equation 1 γL and γS are the surface tensions of the liquid and the solid, respectively and WA is the solid-liquid work of adhesion. The spreading pressure πe can be calculated from the total amount adsorbed (Θ) as a function of partial pressure (p) and the specific surface area (σ), as shown in Equation 2. To solve this equation the adsorption isotherm needs to be measured over a wide range of partial pressures and integrated. As a result the work of adhesion WA and the dispersive and specific components to the surface energies, γDS and γSP S, can be obtained. Inverse gas chromatography involves the sorption of a probe molecule (adsorbate, vapour) with known properties and a adsorbent stationary phase (solid sample) that is to be characterized. IGC SEA may be experimentally configured for finite or infinite dilution concentrations of the adsorbate. The latter method is excellent for the determination of thermodynamic properties such as surface energies and Lewis acid-base parameters. Measurements in this range are extremely sensitive due to the low concentration regime where the highest energy sites of the surface dominate interactions with the probe molecules. For an IGC SEA experiment, different probe molecules are injected and retention times can be determined. The corresponding net retention volumes VN are computed using Equation 3.
where T is the column temperature, m the sample mass, F is the exit flow rate at 1 atm and 273.15K, tR is the retention time for the adsorbing probe and t0 is the mobile phase hold-up time (dead time). “j” is the James-Martin correction, which corrects the retention time for the pressure drop in the column bed. The surface energy can be obtained from the equation of Schultz et al , who derived it from the Fowkes equation. If RTlnV is plotted versus a(γLD )1/2 for a series of alkanes a straight line results and the dispersive contribution of the surface energy can be calculated from the slope. If polar probe molecules are injected, specific interactions can be determined. In the above- mentioned plot, points representing a polar probe are located above the straight line. The distance is equal to the specific component of the free energy ΔGSP (see Equation 5). To calculate acid-base numbers the Gutmann or van Oss concept can be applied [3,4]. The Gutmann approach relates the enthalpy to the acid-base numbers according to Equation 6. The enthalpy term in this equation can be replaced by the free energy if the entropy term in the Gibbs Helmholtz equation is assumed to be negligible. In the experience of the authors this is generally a reasonable assumption. If the acceptor and donor number for the probe molecules are known then Ka and Kb, the acid and base numbers, of the surface can be computed. In the theory of van Oss a similar expression (see Equation 7) can be used and electron acceptor and donor (γS+ and γS-) values for the surface are obtained, if the electron acceptor and donor parameters (γL+ and γL-) of the probe molecule are known. If the van Oss theory is combined with Equation 1, it is possible to calculate the γS + and γS- values using the spreading pressures of a monopolar base and acid, respectively (see Equations 8 and 9). For DVS experiments, the sample was placed into a glass pan and the vapour concentration was stepped up by 2.5% increments until 40%, 5% until 70% and 10% until 90%. Hexane and Dichloromethane have been used as probe molecules. The measurements were carried out at 25 °C and two adsorption and desorption cycles have been recorded to check for hysteresis and reproducibility of data. Nitrogen was used as a carrier gas. Samples were equilibrated in-situ for 30 min in a pure gas stream prior to the experiment. For IGC SEA experiments, samples have been packed into silanised glass columns (400 mmlength and 3 mm ID). Pulse experiments have been carried out at 100 °C with a wide range of probe molecules (Hexane, Heptane, Octane, Nonane, Dichloromethane, Ethyl acetate, Ethanol, THF, Acetone and Acetonitrile). The injection concentration was 3% and helium was used as the carrier gas at a flow rate of 10 ml/min. Prior to the experiment the samples were preconditioned at 350 °C in a pure helium stream for 2 hours. 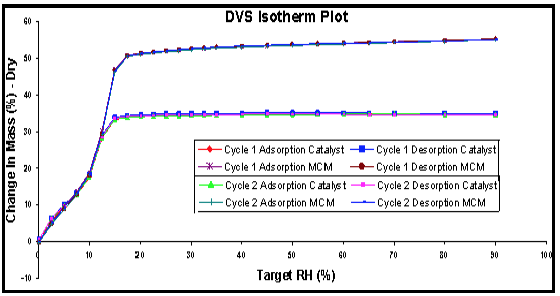 Figure 1.Two complete Hexane adsorption/desorption cycles for MCM41 and the catalyst, measured by DVS at 25 0C. Figure 1 shows two adsorption / desorption cycles for hexane on MCM41 and the catalyst. All isotherms are highly reproducible and show no sign of irreversible adsorption. The catalyst has a significantly reduced uptake compared to the pure support material. This indicates that the active compound is blocking some of the surface centres which were involved in the interaction with hexane and that the surface of the metal oxide has a much lower uptake. BET surface areas have been calculated form these measurements. The MCM41 yielded to 1250.3 m2/g while the catalyst gave an area of 792.0 m2/g. This is in good agreement with nitrogen measurements (1301.5 m2/g and 823.8 m2/g) given the uncertainty introduced by the difference in cross sectional area between nitrogen (assumed to be 1.62 nm) and Hexane (assumed to be 5.15 nm). Figure 2 shows the DVS spreading pressure curves for both samples (obtained with Dichloromethane). After the determination of the dispersive work of adhesion from the Hexane experiment the total work of adhesion can be determined for Dichloromethane. This probe molecule represents a monopolar acid according to the van Oss concept and can be therefore used to determine the base number (γS-) of the surface. For the corresponding determination of the acid number the measurement with a monopolar basic probe molecule is required. Toluene was used to calculate (γS+) for these experiments. 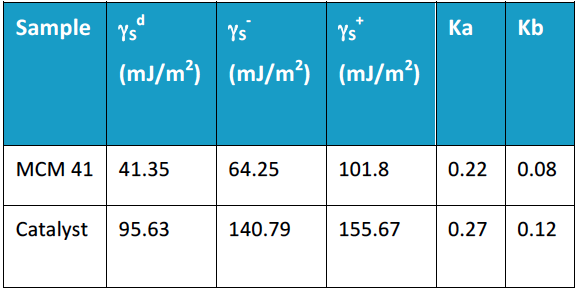 The results for the DVS measurements are summarised in Table 1. Figure 2. 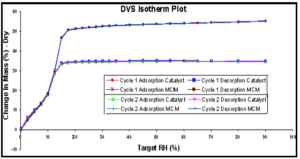 DVS spreading pressure curves for the 2 samples (obtained from the adsorption branch of the first cycle of a Dichloromethane experiment). It can clearly be seen that the catalyst shows higher values for most of the determined thermodynamic parameters compared to the MCM support. From the base numbers (γS-) it can be concluded that the surface of the MCM41 seems to be less basic (or more acidic) than the catalyst surface. 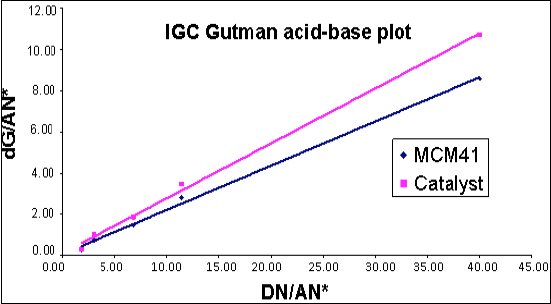 The higher acid numbers (γS+) for the MCM41 sample support these results. Comparing the relative acidity / basisity of the materials reveals that the MCM41 sample is more acidic than the catalyst surface. Table 1. Thermodynamic parameters obtained from a DVS experiment. Experiments were again fully reproducible suggesting reversible adsorption / desorption processes for all probe molecules. 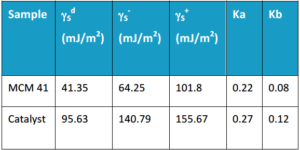 Dispersive surface energies and acid-base numbers are shown in Table 2.
from an IGC SEA experiment. Due to the high number of tested probe molecules it was possible to apply both, the van Oss concept using monopolar probe molecules and the Gutmann approach using bipolar probes. γS+ and γS- numbers as well as Ka and Kb are summarised in Table 3 together with the dispersive surface energies. 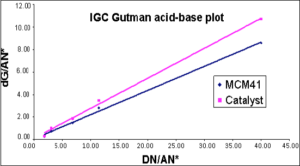 The Gutmann acid-base plot is shown in Figure 3. The dispersive surface energies and the specific free energies as well as the acid-base numbers are significantly higher for the catalyst in comparison to the pure support. Both the van Oss and the Gutmann numbers indicate that the MCM surface is predominantly acidic. This was anticipated by other research groups based on the observation in hydrogenation experiments . When the catalyst is considered, the ratio of the acid to the base numbers becomes smaller suggesting a relative increase in basisity, although the catalyst appears to be predominately acidic. If the results are compared to those obtained from DVS experiments, it becomes obvious that the relative trends for the dispersive surface energy as well as the γS- numbers are similar. Also, both techniques reveal the same trend in relative trends in acid/base ratios: the MCM41 sample is more acidic than the catalyst sample. For the MCM41 there is a remarkable agreement between the results from DVS and IGC SEA given the different theoretical and experimental approach. For the catalyst however, absolute numbers appear to be significantly higher in the IGC SEA results. One explanation would be the difference in the pre-treatment and measurement temperature. IGC SEA pre-conditioning and experiments take place at 3500 C and 1000 C respectively while both procedures are carried out at 25 °C in the case of the DVS. For this reason some of the more active sites might be still blocked by pre-adsorbed water in the DVS experiments. Another reason for this effect is the enhanced sensitivity of the IGC SEA experiment under the chosen infinite dilution conditions, where only highest energy sites dominate the interaction while in the DVS experiment all energy sites are considered, so that values represent an average of all energy sites. A Ruthenium oxide / MCM41 catalyst as well as the pure MCM41 support were studied by inverse gas chromatography and dynamic gravimetric vapour sorption. The obtained energy parameters were all higher for the catalyst, despite the vapour uptake and the surface area being higher for the pure MCM41. Both techniques suggest a more acidic nature of the two materials studied. The relative basisity of the catalyst seemed to be higher. The authors would like to thank Prof. Duncan Bruce, Department of Inorganic Chemistry, Exeter University, UK for supplying the materials used in this study. SMS would also like to thank Dr Frank Thielmann and Helen Jervis for their contribution to the note.